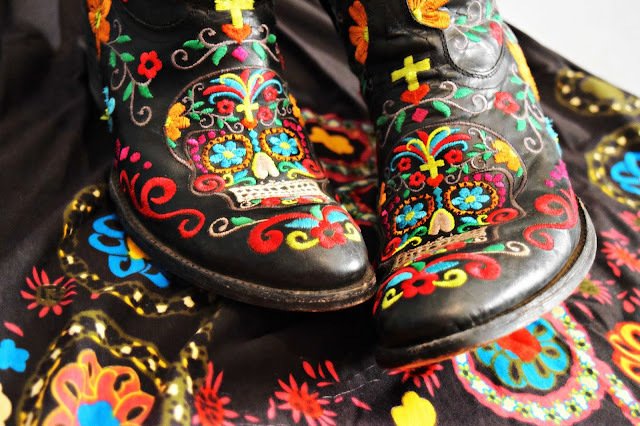 My favorite cowboy boots from Old Gringo feature embroidered candy colored sugar skulls. 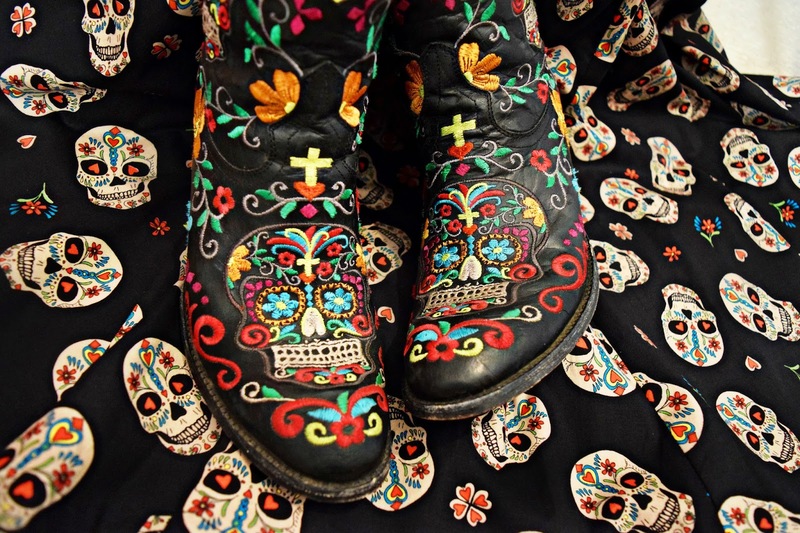 I wear them year round (even at the beach), but the design clearly lends itself well to a Day of the Dead Halloween look. I don't like heavy cream makeup that feels like it's going to come off if you touch it, so I "painted" my face white using powdered eyeshadow. The green around my eyes is water-based metallic green body paint from Wolfe applied with a small artist's brush, which I then topped with a layer of iridescent teal powdered eyeshadow. The addition of the powdered eyeshadow added more depth to the color and also "set" the look. I finished with a setting spray from Urban Decay. The makeup stayed on all night, and looked just as polished after an evening of eating, drinking, talking, and hugging friends as it did when I left the house. In fact, it was actually challenging to remove. Despite their proximity on the calendar, El Dia de los Muertos actually has nothing to do with Halloween. But the beautiful macabre sugar skulls iconic to the Mexican holiday celebrating the lives of lost loved ones make the scary sweet look a classic costume choice. 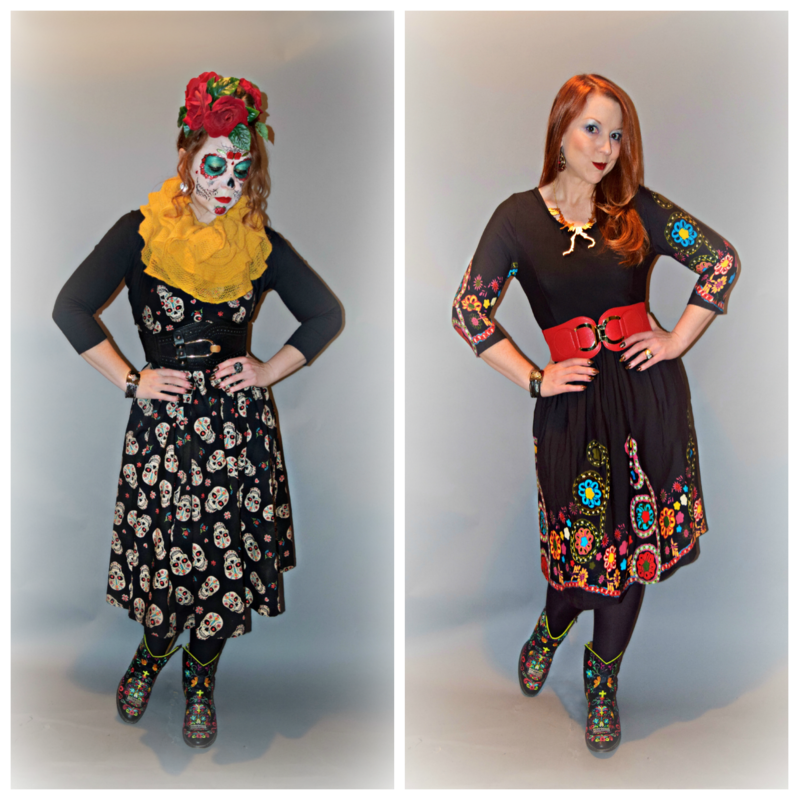 The $30 Reborn Collection floral dress from Zulilly is a super-comfy knit fabric. I ordered it in hopes it would coordinate with my favorite boots, but I was actually shocked at how perfect they are together. 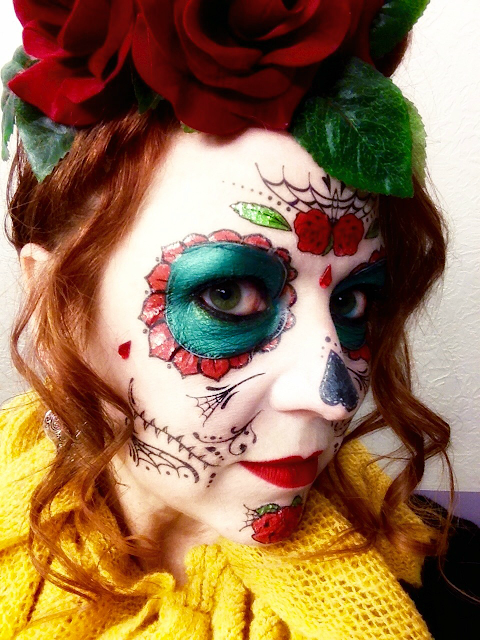 I did a sugar skull face for the first time last year. I'd never done such elaborate makeup, so my friend Kelly Oswalt, a remarkable professional makeup artist, helped me out. 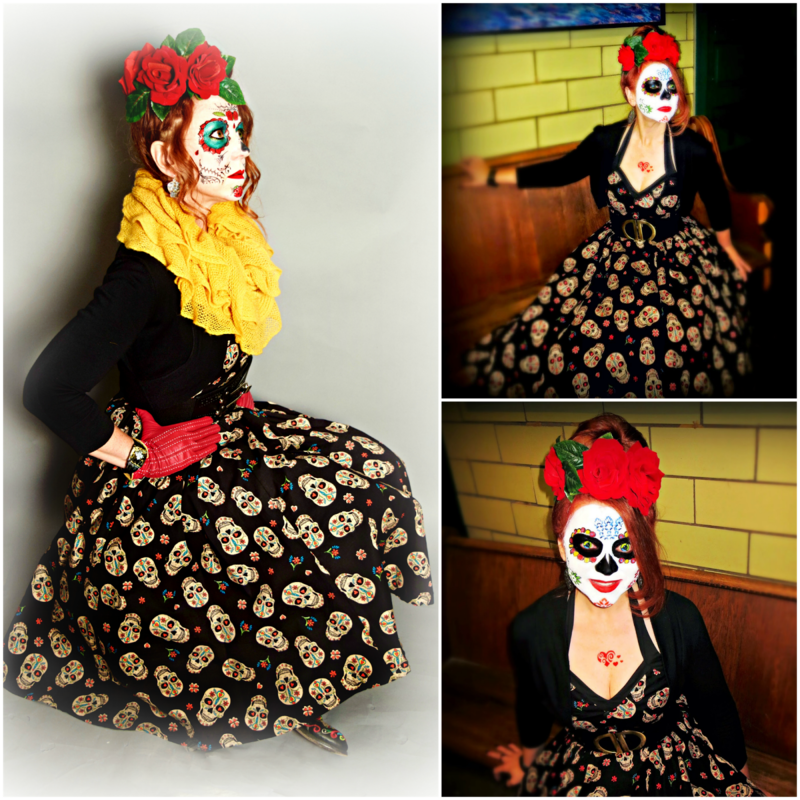 When we were invited to a Day of the Dead themed outing downtown this year, I couldn't resist doing it again, especially since I already had the dress and boots in my closet. The photo on the left is this year's version; the photos on the right are from last year. Last year's look was done entirely with creamy face paints. The white base is more dramatic, but it also came off on my fingers if I touched my face, so I went with a more subtle, powder-based white this year. It helps that I'm very pale to start with - "ginger benefits," I guess. I did my own makeup this time around, using a mixture of professional face paints from Amazon applied with artist's brushes (also from Amazon); temporary tattoos from Walgreens, and regular makeup. Though perhaps not as dramatic as last year's look, which also included killer contacts in a patchwork design, I was really happy with my first attempt at the theatrical look. 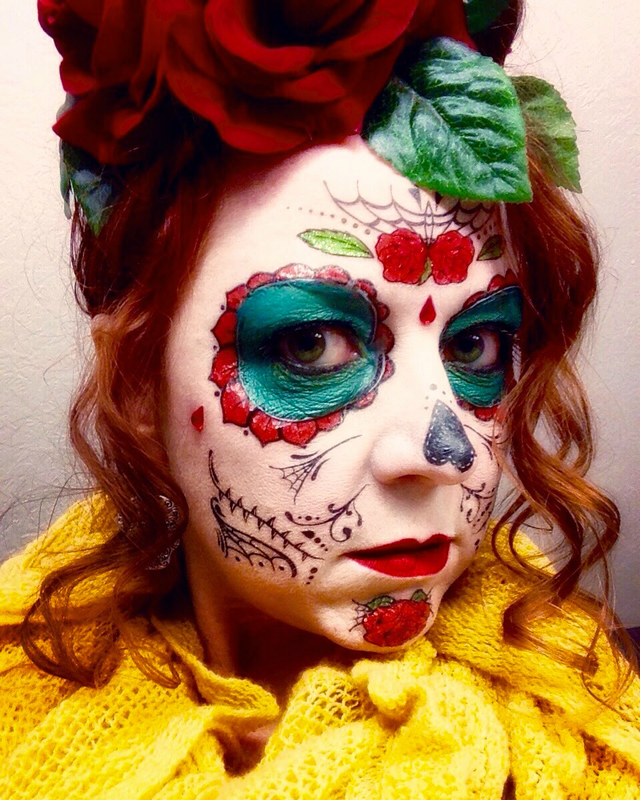 In fact, it inspired me to get more adventurous with my own makeup for a different Halloween celebration last night (to be featured in an upcoming post). I love the sugar skull fabric of this Banned Apparel dress from ModCloth, but it's harder to pull off as an everyday look. In fact, I had so much fun with it, I can't wait to do it again because there are more looks and color schemes I want to try. I may even have to cajole some friends to let me paint their faces next year so I can let my inner artist go wild! Amazing costume! The make-up is brilliant!